Kal Chaudhavin Ki Raat by Ibne Insha that is an all-time favourite ghazal by Abida Parveen, which is less known that her other ghazals. Again it has sufiana touch, which goes beautifully with Abida Parveen’s personality. Abida Parveen has sung many superhit ghazals, but Jab Se Tune Mujhe is a ghazal which resonates beautifully with Abida Parveen’s most loved Sufiana genre also. It’s a sufiana ghazal with Sufiana nuances and heart touching Urdu Shayary by Hakeem Nasir. Hazrat Amir Khusrow can be truly called the first Sufi who was a Musician at the same time as he used music to spread the message of Sufism. Chaap Tilak Sab Cheeni is his most known Arfana Kalam in reverence to his spiritual mentor Hazrat Nizamuddin Awliya. Bulleh Shah is the most known Sufi Poet, whose verses have been sung by artists since hundreds of years across India and Pakistan and beyond. 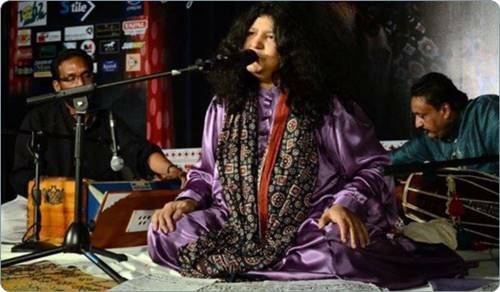 Teray Ishq Nachaya Karke Thaiya Thaiya is a classic Abida Parveen trick that she performed at least 30 years ago, yet it remains fresh as ever. Kithe Meher Ali Kithe Teri Sanaa is Punjabi Kalam by Pir Meher Ali Shah, an arfana Kalam that remains one of Abida Parveen’s golden hits. Sind is the land of exceptional music and rich culture. It is no surprise that Sind witnessed amazing Sufi poets such as Shah Bhitai and Sachal Sarmast. Ghoom Charakhra is one of the most known and loved songs.